Wilson Equipment maintains a fleet of service trucks, ready to provide on-site service for both repairs and routine maintenance whenever and wherever you need it. Our certified technicians are dispatched to your jobsite to perform maintenance activities recommended by the manufacturer at specified intervals. We can optimize your productivity by scheduling these procedures when your machines are idle. When a GPS Fleet Management System is installed in your machines, Wilson Equipment can remotely monitor them and let you know when we receive any alerts for operation problems. Sometimes we spot problems before your operators are even aware of them. We can diagnose required repairs remotely and come prepared to your site with the correct parts and tools to minimize your downtime. 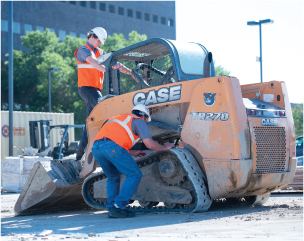 When your equipment breaks down at an inconvenient time, you can count on us to come to your jobsite to repair your machine as quickly as possible. We understand that problems can occur on a weekend or evening, and our techs are available whenever you need them. With five locations serving Kentucky and southern Indiana, Wilson Equipment technicians can quickly respond to your emergency and reduce your downtime.